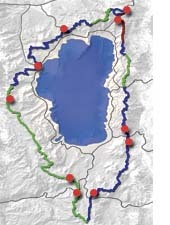 This outings program is a visit to the Tahoe Rim Trail. The Tahoe Rim Trail Association celebrated their twenty fifth anniversary by leading fifteen people on a through hike of their 165 mile trail. Steve hikes from Echo Summit along a section of trail shared by the Tahoe Rim Trail and the Pacific Crest Trail. He meets the hikers at their mid-trip camp at Showers Lake. From there, he hikes with them to Echo Lake. Next week's show will feature wrap-up interviews with some of the trip's participants.